Universal’s mastery of the macabre was waning to a ridiculous degree in the mid-to-late 1940s. The sentiment seemed that the age of vampires, wolf men and phantoms was slipping away and being discarded to a bygone era. In 1948, Universal drastically shifted gears toward a more comedic approach when it came to create their once dark horror films. This was done to reach a different theater-going audience while still connecting with their loyal followers. Yes, comedy was about to mix it up with fright in the ole sandbox of celluloid. Bud Abbott and Lou Costello – two well-respected and successful comedians – joined forces with none other than Larry Talbot/Wolf Man (Lon Chaney Jr.) to thwart the villainous Count Dracula (Bela Lugosi) and Frankenstein’s Monster (Glenn Strange) in Abbott and Costello Meet Frankenstein. The venture seems like a ridiculous premise, but the film is the epitome of the well-mixed horror/comedies that followed decades later (Fright Night 2, Evil Dead 2, The Texas Chainsaw Massacre 2). Arguments continue to rage over the validity of Abbott and Costello Meet Frankenstein’s place among the Universal Monster movies. But despite its light-hearted tone and comical theme, the movie is without question canon. The playful banter and whimsical jokes between Chick (Abbott) and Wilbur (Costello) carry the movie, but also diminish the once horrifying legacy of the Count, the Monster and the Wolf Man. It’s hard to take Dracula seriously when he is having so much trouble dealing with two freight handlers. However, there is a nuance of validity restored as Lugosi and Chaney, Jr. both reprise their respective iconic roles. Regardless, the picture is geared toward a younger audience so there is little fright to be found here. But between Charles Van Enger’s cinematography alongside Hilyard Brown and Bernard Herzbrun’s art direction, you get the genuine feel of the old Universal Monster movies. Abbott and Costello Meet Frankenstein is a worthy feather in the cap for Universal but it’s not to be confused, or even suggested, that it shared the same rarefied air as Dracula (1931), Frankenstein (1931) and The Wolf Man (1941). Be prepared to chuckle at comedians Abbott and Costello but resign yourself to simply seeing old friends when it’s time for the monsters to take their turns on the screen. Indeed, one of the funniest moments, and most thrilling creature-feature cameos, comes near the end when Chick and Wilbur escape in a rowboat. No spoilers here, but keep your eyes and ears open as the comedic duo is visited by an illustrious maestro of the macabre. Abbott and Costello Meet Frankenstein celebrates its 70th anniversary on June 15, 2018. Near the climax of the picture, as Frankenstein’s monster burns and our heroes escape, the Invisible Man joins Wilbur and Chick in their rowboat. The Invisible Man was a prominent fixture in Universal’s roster of monsters and he is voiced in Abbott and Costello Meet Frankenstein by none other than Vincent Price. The film is loaded with wonderful animation sequences particularly of Count Dracula changing to and from a bat. The talented artist who carried out those memorable scenes is none other than Woody Woodpecker’s Walter Lantz. Abbott and Costello Meet Frankenstein was a huge financial success. The recipe for mixing the Universal Monsters with comedy’s golden duo resulted in box office boffo. The film cost $800,000 to produce but made over $3.2 million for the studio. Lou Costello was not at all sold on doing the film. In fact, Costello is on record as saying, “No way I’ll do that crap! My little girl could write something better than this.” The studio sweetened the deal by bringing Costello’s friend Charles Barton on to direct the project. And if that weren’t enough, Universal paid Costello a $50,000 advance to do the movie. All total, Abbott and Costello were paid $105,000 salary. Bela Lugosi reprises his role as Dracula for the first time since the original picture in 1931. Lugosi played the Count on stage hundreds if not thousands of times and he is arguably the most recognizable figure when it comes to the character of Dracula. However, Lugosi only played the Carpathian Count two times on the Silver Screen. 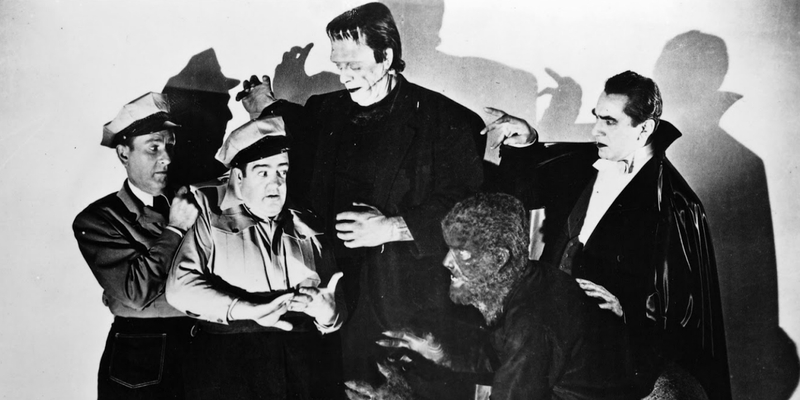 Even as comedians Abbott and Costello went on to make four more team-up pictures with the Universal Monsters, Abbott and Costello Meet Frankenstein was the last Universal movie to feature Dracula, Frankenstein’s Monster and the Wolf Man until the release of Van Helsing in 2004. Boris Karloff was approached to reprise his role as the Frankenstein Monster and flat out refused. The rivalry had grown between himself and Lugosi and Karloff wanted nothing to do with playing the Monster next to Bela’s Dracula. However, Karloff felt he owed Universal. As a favor, “The Uncanny” promoted Abbott and Costello Meet Frankenstein for the studio. Karloff’s one stipulation was that he didn’t have to watch the movie. Wait, what? Yes, that’s right. Universal agreed and Karloff did press for the film. Karloff later starred in two of Universal’s team-up films with Lou and Bud: Abbott and Costello Meet the Killer, Boris Karloff (1949) and Abbott and Costello Meet Dr. Jekyll and Mr. Hyde (1953). Jack Pierce, the famous make-up artist responsible for so many of Universal’s Monsters, did not work on Abbott and Costello Meet Frankenstein. The workload fell to Bud Westmore and Jack Kevan. As Universal changed to Universal International a premium was put on saving money to make films. Jack was never under contract, and only a hourly employee, so Pierce was fired to save a buck. 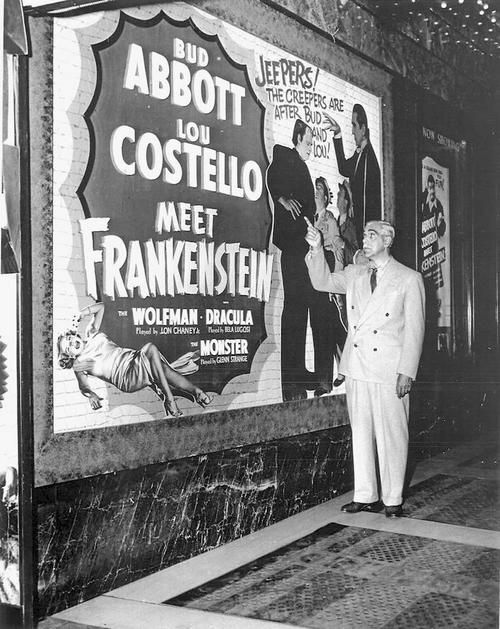 Boris Karloff promotes Abbott and Costello Meet Frankenstein which opened in theaters on June 15, 1948.